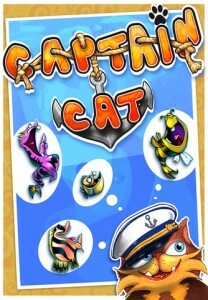 Captain Cat Pocket, an iPhone game developed by Digital Tentacle, is a fun iPhone game where players fish for coins and cute sea creatures. Featuring bold characters and single finger gameplay, Captain Cat and his adventures are perfectly suited for younger players. This iPhone Game revolves around a simple goal: take Captain Cat out to sea and fill his boat (and his belly) with tasty fish and other creatures. You also need to guide your hook precisely in order to avoid rocks and collect coins. The controls are very simple. Press and hold the boat, then slide it to an area of open ocean. 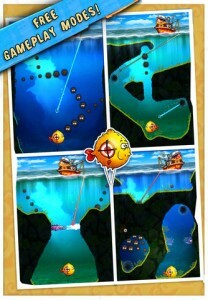 Next, tap to release the fishing hook into the water. Hold your finger down to send the fishing line shooting down into the murky depths. Need to avoid obstacles? Lift your finger up, and the hook will stop its descent, and then begin swinging from side to side. Once the hook is pointed in the right direction, hold your finger down again to send the fishing line in that direction. 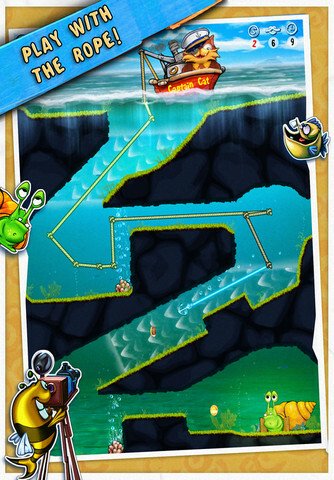 Be careful, though: one wrong move and your hook will hit an obstacle, forcing you to start your fishing trip all over again. To make things more challenging, there is a star system. To get a three star resolution for each level, you need to use as few knots as possible in your rope (that means not changing direction very often.) 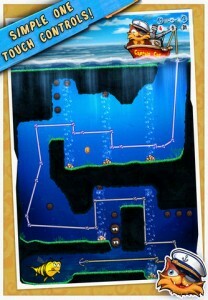 You also need to be speedy and collect every single piece of treasure in the level. With 75 levels to explore, great graphics, and fun characters, Captain Cat Pocket is a stupendous puzzle title for adults and kids alike. If you love cats and addictive puzzlers, there’s no reason to miss out on this reasonably priced title from Digital Tentacle. 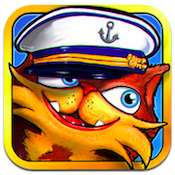 Captain Cat Pocketis compatible with iPhone, iPod touch, and iPad. Requires iOS 4.1 or later.A small expedite fee was paid by the developer to speed up the publication of this iPhone game review.